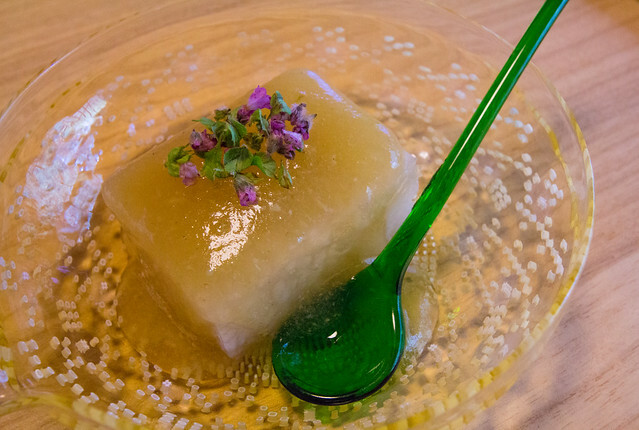 Kyoto has several Michelin awarded restaurants serving Kaseki cuisine, a meal (usually lunch or dinner) that has a set of dishes that are very elaborate and exquisite. 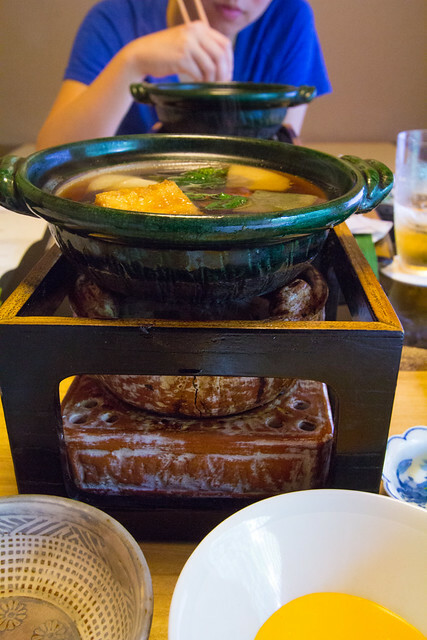 Kaiseki ryori (懐石料理) is traditional Japanese multi-course haute cuisine. 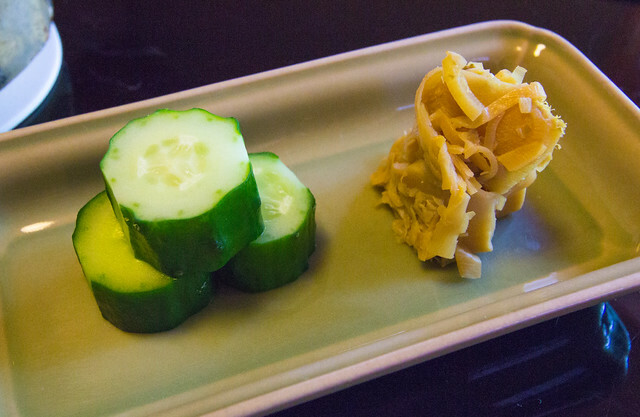 Its origins are found many centuries ago in the simple meals served at the tea ceremony, but later it evolved into an elaborate dining style popular among aristocratic circles. 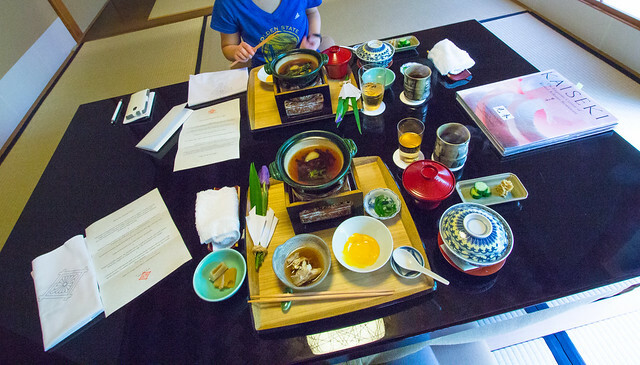 Today, kaiseki is served in specialized restaurants or can be enjoyed by staying at a ryokan (Japanese style inn). Kaiseki meals have a prescribed order to their dishes, most of which are prepared by using one of the common techniques of Japanese cooking. 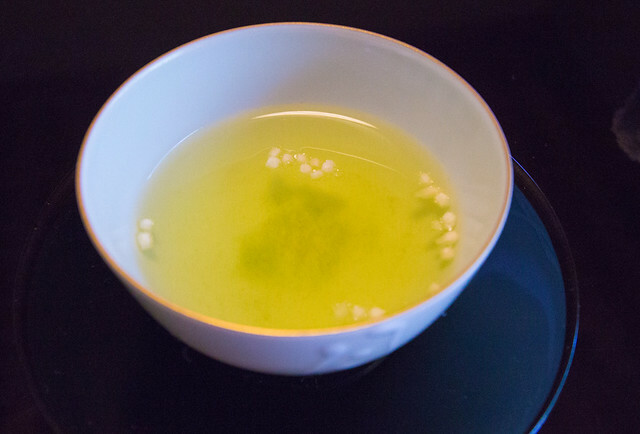 However, kaiseki chefs have considerable freedom to add, omit or substitute courses in order to highlight regional and seasonal delicacies and personal style. 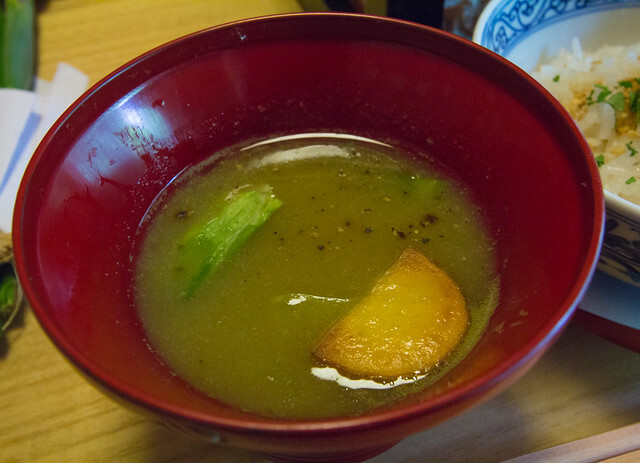 Originally, kaiseki comprised a bowl of miso soup and three side dishes; this is now instead the standard form of Japanese-style cuisine generally, referred to as a セット (setto, “set”). 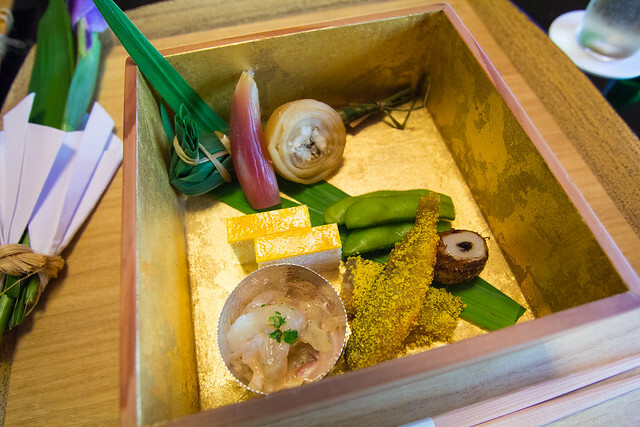 Kaiseki has since evolved to include an appetizer, sashimi, a simmered dish, a grilled dish, and a steamed course, in addition to other dishes at the discretion of the chef. Yakimono (焼物): (1) flame-grilled food (esp. fish); (2) earthenware, pottery, china. We chose to experience kaiseki at Kikunoi Honten because it was recommended by my cousin, and it was the cheapest of all the three-star restaurants. Lunch prices are also usually cheaper than dinner, if you’re concerned about budgeting your trip. 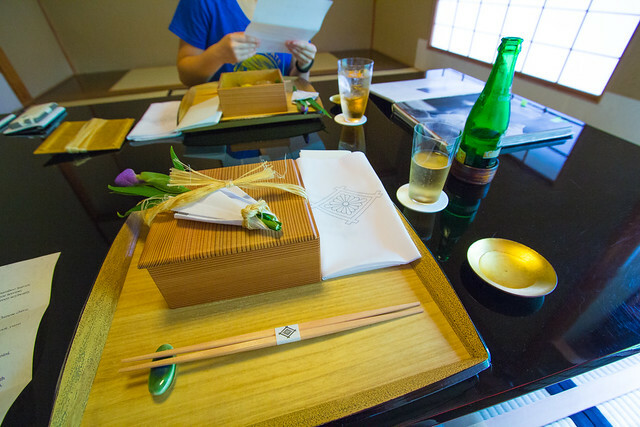 At Kikunoi, kaiseki cuisine starts at ¥8,000 for lunch and ¥15,000 for dinner. 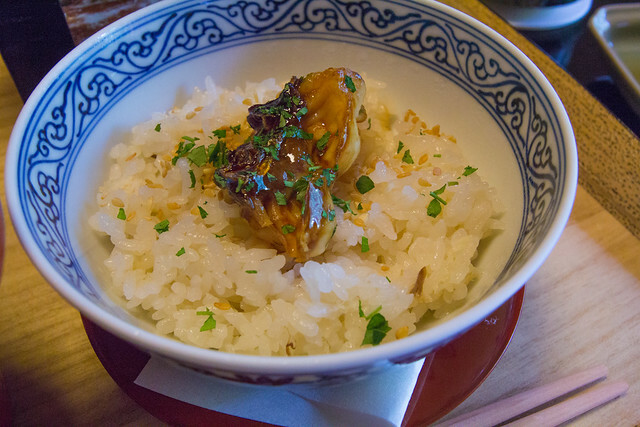 Kikunoi has a different menu every month, to reflect the current season. 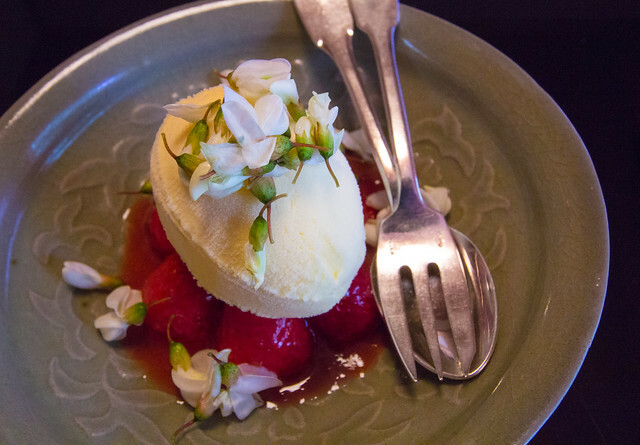 In our case, it was spring and that was evident throughout our meal through the use of flowers. Each course was brought out individually, in a timely manner. We started off with a light, hot green tea drink. I also had ginger ale, while my sister had wine. Then we had hassun and sakizuke, which was an assortment of appetizers, for our first course: tai (red sea bream) sushi wrapped in bamboo leaves; anago eel rolled with gourd strip; pickled myoga ginger; tai roe terrine; taro and fermented soybeans; pickled greenling fry; edamame (green soybean); pickled tai meat and milt. 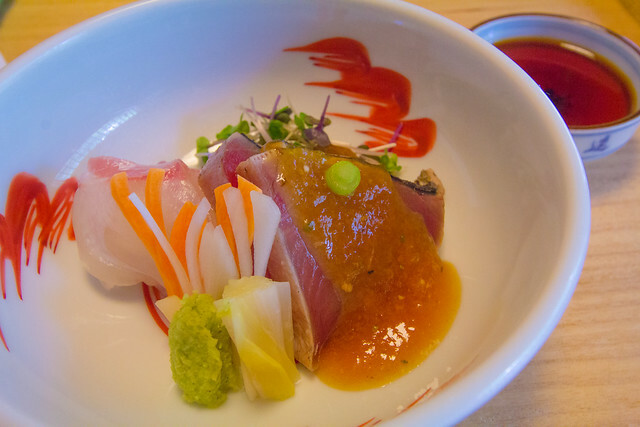 Next was mukozuke, a sashimi dish: sashimi of seared bonito and tai (red sea bream), vinegared yellow Chinese chive, iris-petal udo stalk and carrot, wasabi, ponzu jelly. 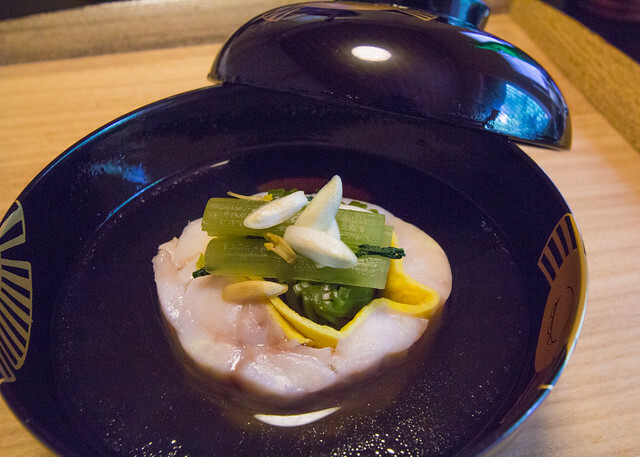 The third course was futamono, a lidded, substantial, hearty dish: tea-steamed tilefish, fresh green tea leaves, tea soba noodles, egg, coltsfoot, yuzu. 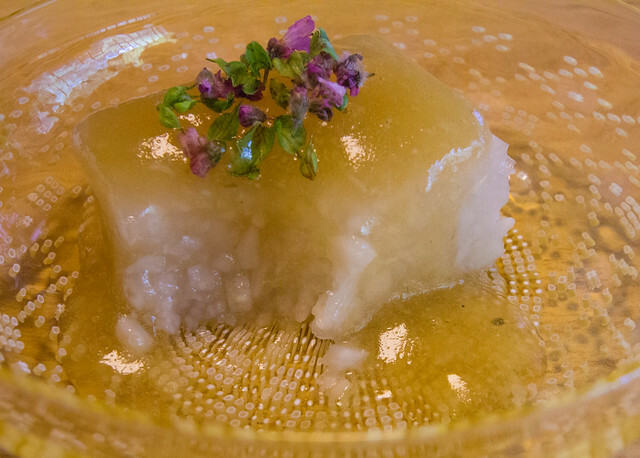 Fourth course was su-zakana, a cold dish to refresh our palates: gelée of mountain yam, shiso flowers, wasabi jelly. 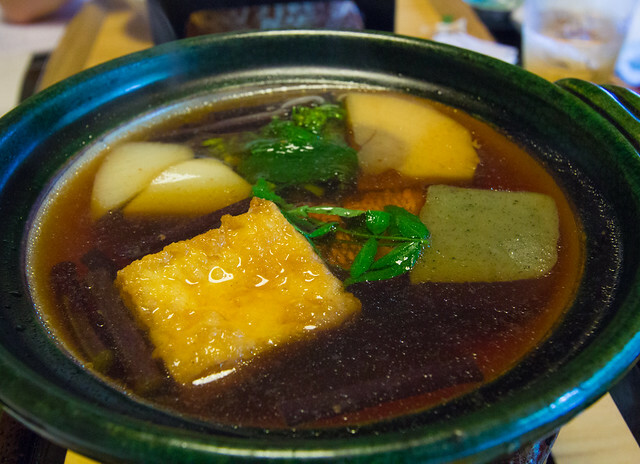 For the fifth course, we had shiizakana, a substantial hot pot dish: hotpot of sansho pepper, tai, bamboo shoot, warabi fern heads, udo stalk, rapini, fried tofu, mugwort wheat gluten, egg yolk emulsified with vinegar. The sixth course was gohan (cooked rice with seasonal ingredients), ko no mono (seasonal home-pickled vegetables), and tome-wan (soup served with rice and the pickled vegetables): grilled tai rice with kinome herb and sesame seeds; bamboo shoot pickled with sansho pepper, cucumber in rice bran; new cabbage soup new potato, black pepper. We were super full when we were halfway through our rice! But we still had to make room for the last course! 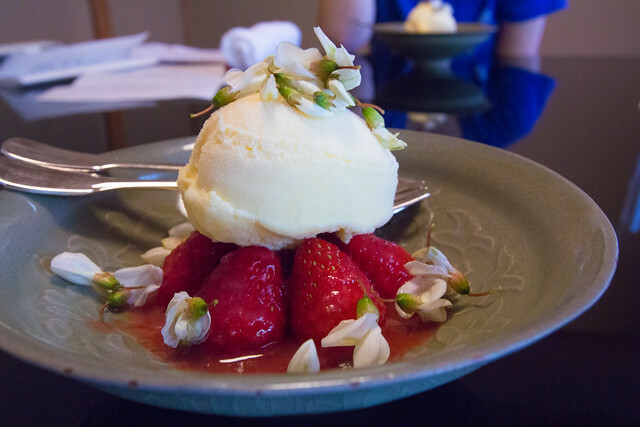 Last course was mizumono, desserts: milk ice cream, strawberry, strawberry sauce. 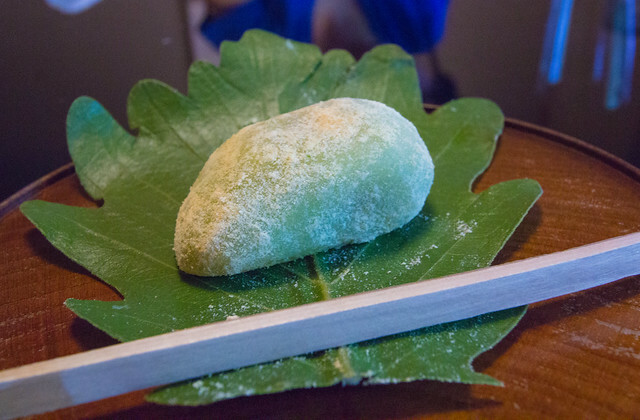 We also had kusa mochi, a sweet and chewy rice cake with mugwort, and filled with red bean paste. 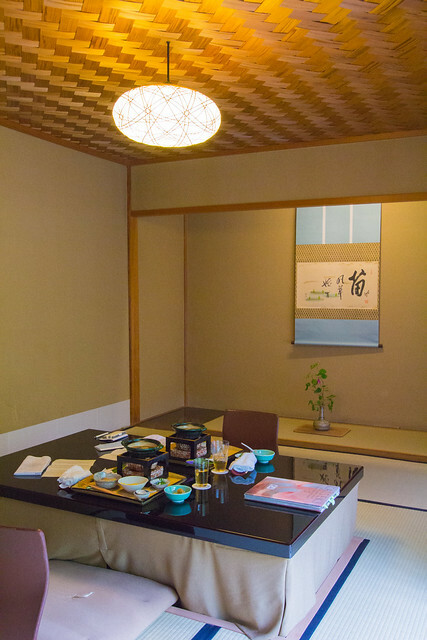 Kikunoi is a family-owned restaurant/hotel business that has lived for 3 generations. The owner/chef’s daughter was our host. 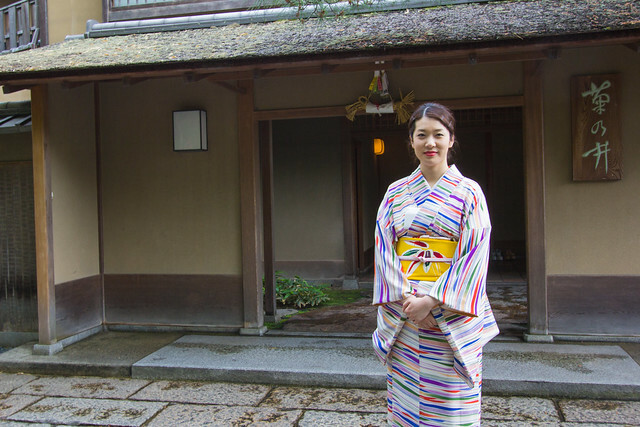 She kindly greeted us at the beginning of our kaiseki experience, and gladly posed for a photo when we left Kikunoi! My sister and I had a memorable experience at Kikunoi! This was also our most expensive meal to date as the bill came down to ~¥10,600 per person (~$85 USD). I highly recommend experiencing kaiseki in Kyoto at least once in your lifetime! For Kikunoi, reservations must be made in at least 3 months in advance (by phone only; they do not take online reservations).